Beautifully engraved certificate from the American Elevated Railroad issued in 1903. 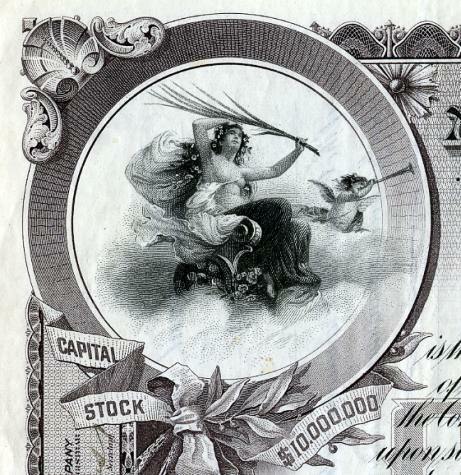 This historic document was printed by the International Banknote Company and has an ornate border around it with a vignette of a woman and cherub in the clouds. This item has the signatures of the Company’s President, Osborn Congelton; Treasurer, Henry West and Transfer Agent and is over 115 years old. Inquiries continued to be made yesterday concerning the affairs of the American Elevated Railroad Company, to which wide attention has been drawn by the collapse Of the stock from 45 to 1. The management of the company has all along denied having any Connection whatsoever with the trading in the stock, and until yesterday refused to offer any explanation for the decline which has occurred within the last ten days. 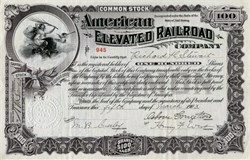 AMERICAN ELEVATED STOCK. President Congelton Issues a Statement Explaining the Decline. Inquiries continued to be made yesterday concerning the affairs of the American Elevated Railroad Company, to which wide attention has been drawn by the collapse Of the stock from 45 to 1. The management of the company has all along denied having any Connection whatsoever with the trading in the stock, and until yesterday refused to offer any explanation for the decline which has occurred within the last ten days. President Osborn Congelton yesterday Issued a statement giving the company s view of the causes that led to the collapse of the stock. He states that certain persons who thought they knew the plans of the company, and that these would result in much higher prices for the stock, bought up about $500.000 of the stock, and in order to dp so arranged a number of loans on the stock with banks in this city, in Philadelphia, and Pittsburg. Some of these loans, it is stated, were called and .the borrowers were unable to take them up. The effort to soil the stock followed, and resulted in the discovery that there was practically no market for the stock. President Congelton further stated that those who had been In the stock had appealed to him for assistance, and that he had refused it. The plans of the company, the statement adus, are in no wise affected by the decline in the stock, as it has no debts. In the outside market yesterday nearly 2.0UO shares of American Elevated sold at 1 1/4 aid 1 3/8 as compared with sales on Wednesday at 1.